At 7PM same day added new Samsung Galaxy S III numbers at the end of the this article. 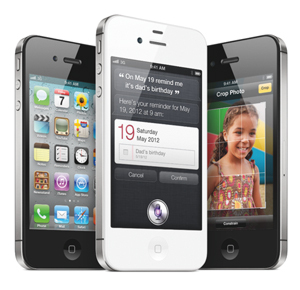 We observed a dichotomy involving the iPhone 4S versus competing smartphones. Look over the test results. In case you don't see it, we'll tell you. Linpack Benchmark measures how fast a smartphone solves a dense N by N system of linear equations Ax = b, which is a common task in engineering. The solution is obtained by Gaussian elimination with partial pivoting, with 2/3�N3 + 2�N2 floating point operations. The result is reported in millions of floating point operations per second or Mflops. HIGHER number is faster. RED bar indicates fastest smartphone in this test. GLBenchmark 2.1 includes an interesting Egypt 'walkthrough' in High Quality revealing how well the smartphone handles on-the-fly rendering of textures, dynamic shadows, etc. Because the screen resolutions vary from phone to phone, the Offscreen mode is best because it uses a virtual 1280x720 screen for all phones. Higher number is faster. RED bar indicates fastest smartphone in this test. And the also interesting "T-Rex meets nice lady with torch" GLBenchmark "Pro" test. Higher number is faster. RED bar indicates fastest smartphone in this test. The iPhone 4S is faster than the other smartphones when doing OpenGL graphics as in GLBenchmark but slower than the newest, fastest smartphones when running a CPU intensive tests like Sunspider and Linpack. Today at 11am PST, Samsung announced the Galaxy S III. Anandtech posted benchmarks this evening showing it running Sunspider in 1425 ms and GLBenchmark 2 Egypt Offscreen at 103 FPS, and Pro Offscreen at 130 FPS -- all three results faster than all smartphones in the graphs above. Engadget clocked the Galaxy S III running Linkpack Multithreaded at 102 Mflops -- slower than the iPhone 4S and the HTX One X.